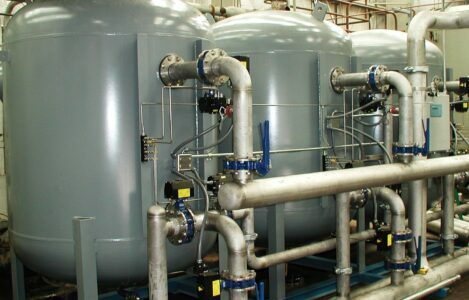 The primary purpose of carbon filters (filled with “activated carbon”) is to eliminate chlorine and remove organic material from source waters including ground, surface, municipal, and waste. Activated carbon removes chlorine as well as residual traces of trihalomethane and other taste, color and odor-producing organic molecules. The process is called adsorption. The water to be treated passes downward through the carbon media at a controlled flow rate. The bed is backwashed (reverse flow) to fluff up the bed, and remove collected particles by washing to drain. Backwashing will also prevent channeling. All steel tanks are epoxy lined inside. Standard production units consists of 100 lbs. working pressure FRP tanks (up to 60” x 72”), and steel tanks (66”D and above), tested to 150 lbs. On larger units, there will be five low pressure drop valves used to perform the steps of backwashing, fast rinse and service.